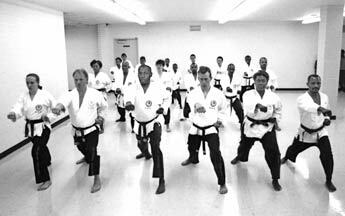 If you want to find out more about our training system or style, the best way is to see for yourself an actual class in progress. You are advised to watch from the very beginning until the very end, because the training flows from one element (such as warming up, basic movements, practising self-defence techniques, etc.) to the next. If you see only part of the procedure, you might mistake the part you have seen for the complete session; this could give you the wrong impression. You are most welcome to watch us training at any of our classes. Watching our training is free. If you wish to enrol after watching a session or if you still have any questions to ask, please see the instructor or instructress in charge and he or she will be happy to assist you. We train barefoot. Initially just wear a comfortable T-shirt and a pair of loose-fitting trousers, like an old pair of track suit bottoms. Do avoid wearing trousers with metal or plastic zips as these can cut and cause other injuries. But if you haven’t got any suitable ones, please don’t go out to buy them, because when you are ready you have to wear the official Wu Shu Kwan uniform, which you can buy through your instructor or direct from the Wu Shu Kwan office. Our classes take children from twelve years of age. But some classes will take them from eight if they train alongside someone from the family who is twelve or older – preferably an adult. Don’t worry at all if you can’t get all the exercises and techniques (or even any of them) right the first time. Be patient, keep trying and do not give up easily. As time goes on, you will find them easier and easier to perform. Before long, these movements will be second nature to you. You will find that all the warm-up and basic movements are repeated at every training session, and you will be able to pick them up in your own time with the help of your instructor. Initially, try to enjoy yourself and take it very easy. In all the exercises that you are attempting, you must breathe naturally and do not hold your breath. Even if you are struggling, so to speak, with the exercises, you are still reaping their beneficial effects. With each attempt at them, you are getting better and better at controlling the movements of your body, arms and legs. At the same time, you are in fact getting stronger and fitter. All in all, you are learning and improving. Start slowly and gradually, and be progressive in your training. If the initial practice is done too vigorously (especially if you are unused to doing exercises), your whole body will be aching over the following day(s) and you will feel extremely uncomfortable. Injuries could easily result from trying too hard if you do not allow enough time to break yourself in. Anybody can give you advice, but the correct and useful one can only come from a competent instructor. Incorrect and misleading instructions can give rise to frustration and confusion. Anyone who persists in regular practice will achieve success in a much shorter time than someone who may train strenuously but at irregular intervals. The more frequently and regularly you train with concentration, the quicker you will develop the proper technique and acquire real knowledge. However, train but don’t strain. A senior woman member showing how effective a hooking kick is against an attacker. C. K. Chang (8th Degree Black Belt), the Grand Master, using an airborne technique against a sword attack. Correct training principles and hard practice over many years have honed his skill to perfection. 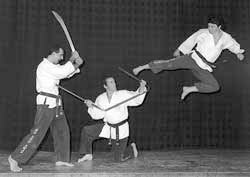 Bernie Sharland (5th Degree Black Belt) (Australia) (centre), a Senior Master, showing the traditional application of three-section staff against two attackers. 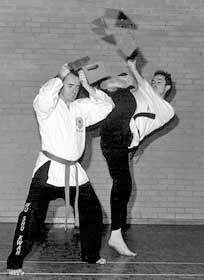 Jake Fitzpatrick (5th Degree Black Belt), a Senior Master from North Wales, breaking 4 pieces of wood with a mighty side kick. Jake is a very powerful fighting machine and a highly respected senior Wu Shu Kwan instructor. Paul Ingleton (5th Degree Black Belt), a Senior Master and a Guinness World Recorder holder, demonstrating the high jumping kick that won him the title. 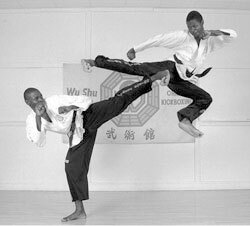 Tyrone Steve Tairu (4th Degree Black Belt) (left), a Senior Master hailed from Canada, using a well-timed side kick against his twin brother Kenny's flying side kick. 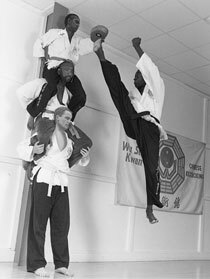 Both brothers are dedicated Wu Shu Kwan instructors and possess great skills. 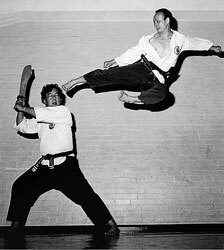 Dr Phillip Dempsey (2nd Degree Black Belt) (France), a Senior Master, breaking roofing tiles placed on his brother Marc's head. A brother always serves as a convenient volunteer for such unusual tasks. 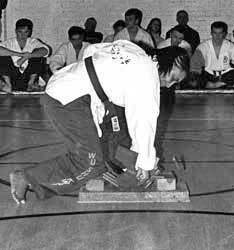 Andrea Farmer (5th Degree Black Belt), a Senior Master Instructress, breaking a stack of roofing tiles with ease. 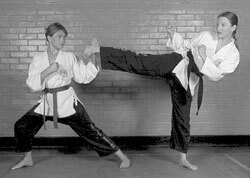 Molly Taylor (2nd Degree Black Belt) (right), a Senior Master Instructress, showing the finer points of an effective side kick to her student. Watch Paul Ingleton breaking the Guinness World Record for the highest jumping kick in 2000.